Decades ago, Holman Bible Publishers was a pioneer in the development of UltraThin Bibles, giving careful attention to breakthroughs in typog- raphy and paper manufacturing in order to produce this favorite line among users that combines readability and portability as well as durability. 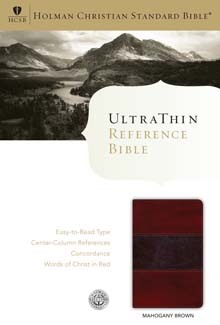 This edition of the HCSB UltraThin Reference Bible is based on a new typesetting of the HCSB text, a more robust cross reference system, and binding with a higher aesthetic appeal. Other standard features include a presentation page, family records section, eight full-color maps, concordance, plan of salvation, alternate readings, HCSB Bullet Notes, and a two-piece die-cut gift box.